Started in 1981, Rodale Institute’s Farming Systems Trial is the longest-running side-by-side comparison of organic and conventional grain cropping systems in North America. For nearly 40 years, we have collected data measuring differences in soil health, crop yields, energy efficiency, water use and contamination, and nutrient density of crops grown in organic and conventional systems managed with different levels of tillage. It all starts with the soil. Healthier soils hold more water, giving plants a leg up during periods of drought. Healthy soil also binds together better, preventing soil erosion and runoff into waterways. Because organic systems don’t use chemical inputs, toxins stay out of the environment and fewer fossil fuels are used. 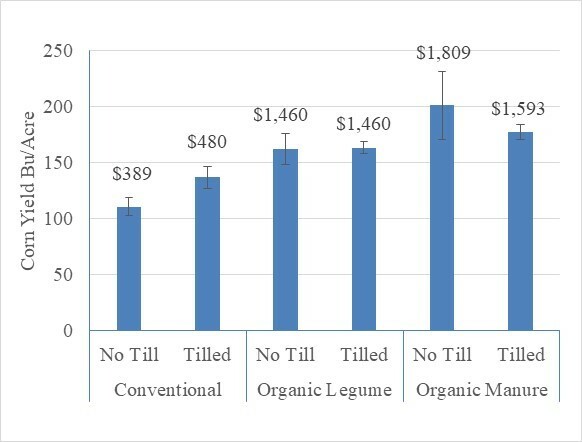 Methods like organic no-till keep energy costs down, too. 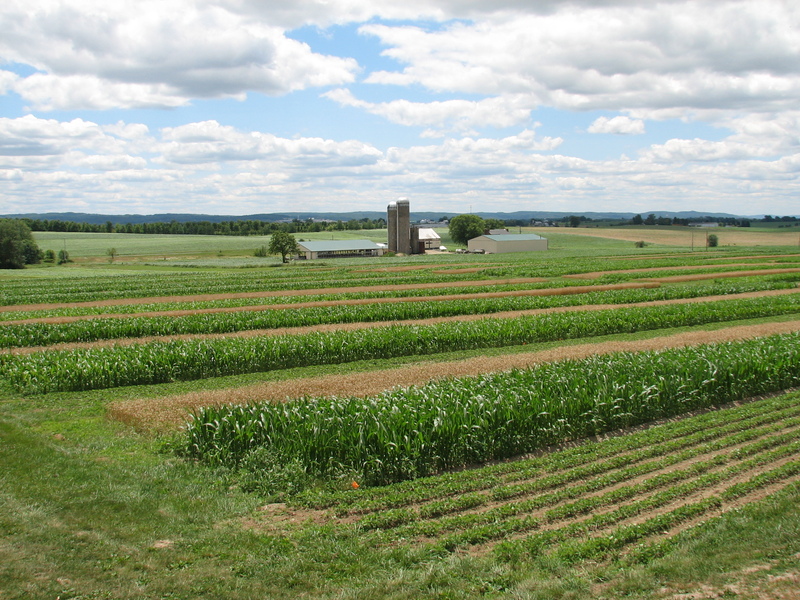 The Farming Systems Trial is located on 12 acres at our main campus in Kutztown, Pennsylvania. It is divided into 3 overarching systems: organic manure, organic legume, and conventional. Each system is further divided into two: tillage and no-till, for a total of 6 systems. There are a total of 72 experimental plots. 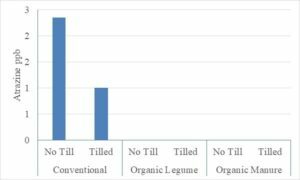 A note on tillage: No-till and organic no-till are not created equal. Conventional no-till utilizes herbicides to terminate a cover crop, whereas organic systems use tools like the roller crimper. 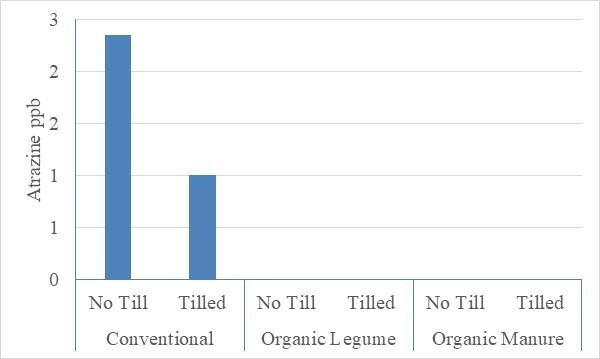 We have found that organic no-till practices year after year do not yield optimal results, so our organic systems utilize reduced tillage and the ground is plowed only in alternating years. This system represents an organic dairy or beef operation. It features a long rotation of annual feed grain crops and perennial forage crops. Fertility is provided by leguminous cover crops and periodic applications of composted manure. A diverse crop rotation is the primary line of defense against pests. This system represents an organic cash grain system. It features a mid-length rotation consisting of annual grain crops and cover crops. The system’s sole source of fertility is leguminous cover crops and crop rotation provides the primary line of defense against pests. This system represents a typical U.S. grain farm. It relies on synthetic nitrogen for fertility, and weeds are controlled by synthetic herbicides selected by and applied at rates recommended by Penn State University Cooperative Extension. Organic matter is the amount of bacteria, fungi, and other microorganisms present in a soil sample. 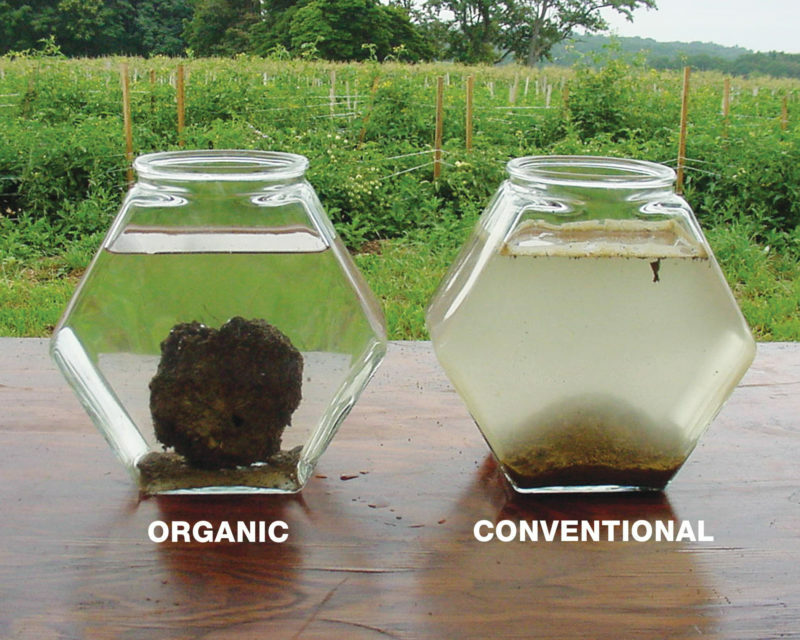 The more organic matter in a sample, the healthier that soil is. Due to improved soil health, 15-20% more water percolates through the soil in organic systems, replenishing the ground table and helping organic crops perform well in extreme weather. More organic matter also means more total microorganisms that make nutrients available to plants for strong growth. The Farming Systems Trial was started by Bob Rodale, who wanted scientific backing for the recommendations being made to the newly forming National Organic Program in the 1980s. Today, the trial is divided into a total of 72 experimental plots. The Farming Systems Trial was designed to assist farmers looking to transition from conventional to organic, and is intended to yield practical data. We utilize an advisory board of farmers from around the country who make sure our methods are consistent with contemporary practices. We analyze grain cropping systems because 70% of crops grown in the United States are grains including corn, soy, oats, and wheat. FST is intended to be a model of standard agricultural techniques, so GMO crops and no-till were introduced to the conventional plots in 2008 when their use became widespread across the country. FST is a long-term study by intent. Short-term studies that take place over only a few years can’t measure longer-term weather effects, like drought, that will inevitably occur, or biological changes to the soil, which can happen slowly. We need long-term studies to find real solutions to problems affecting the future of global food production. Recent results reveal that conventional farming systems leach atrazine, an herbicide known to disrupt human and animal endocrine systems, in amounts between 1 and 3 parts per billion into the water table (Figure 1). Replicated controlled studies on frogs have shown that exposure to atrazine at just 0.1ppb causes significant changes to male frogs’ hormonal profiles, rendering them hermaphroditic. Humans may tolerate higher levels of atrazine than amphibians, but the chemical’s marked effect on animals and ecosystems at levels lower than previously thought is cause for concern. Organic systems, which do not rely on synthetic inputs, leach zero atrazine. 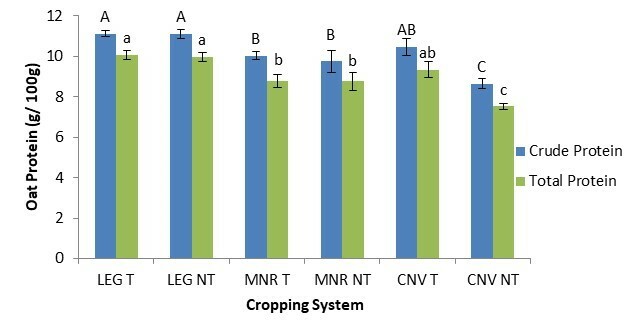 Organic oats grown in systems utilizing legume cover crops contain significantly greater total protein concentration (Figure 2) along with a suite of essential and non-essential amino acids. We also found significantly greater soil carbon and nitrogen (the building blocks of proteins) in both organic systems compared to the conventional system. 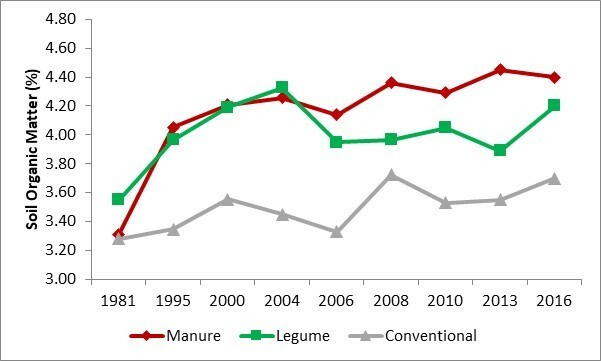 In 2016, our no-till organic manure systems produced 200 bushels of corn per acre—a record-breaking yield for our county that was almost twice the conventional no-till system (Figure 3).